The search for a pilot who disappeared after saying a large object was hovering above his plane was stepped up today. 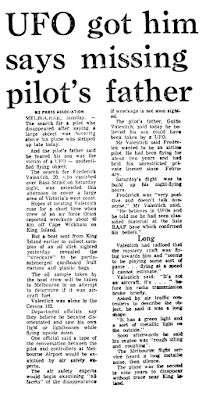 And the pilots father said he feared his son was the victim of a UFO – Unidentified Flying Object. The search for Frederick Valentich, 20, who vanished over Bass Strait on Saturday night, was extended this afternoon to cover a large area of Victoria’s west coast.